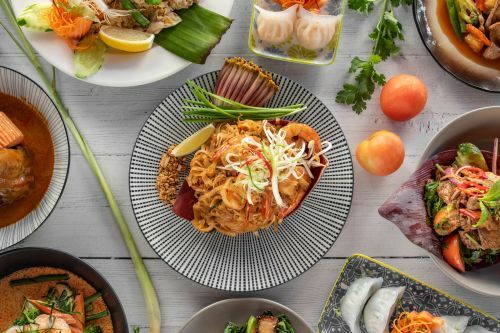 Urban Thai Sydney uses their own specialised couriers to deliver their food. Marinated skewers with peanut dressing. Clear spicy soup with tender pork bones. Mixed seafood tossed with lemon juice, chilli and Thai herbs. Snow peas with chilli jam, lime juice and Thai herbs, mince chicken and prawn. Spicy green curry with mixed vegetable cook in aromatic coconut. A mild red curry with mixed vegetable cook in aromatic coconut milk. Mild Red curry with coconut milk topped with crushed peanuts. Spicy Thai curry without coconut milk. A mild curry with tender pork belly, ginger and garlic in a spice broth. Stewed beef in mild Thai curry with potatoes and coconut milk. Slow cook lamb shank in Massaman curry with potatoes and coconut milk. Sweet and Sour Stir-fried with mixed vegetables. Mixed vegetables, chilli and fresh basil. Chilli paste, Thai herbs and mixed vegetables. Stir-fried with ginger and mixed vegetables. Spicy Stir-fried with fresh chillies and mixed vegetables. Stir-fried with chilli jam, mixed vegetables and cashew nuts. Stir-fried tamarind sauce with mixed vegetables. Stir-fried lemongrass with lemon juice and a touch of chilli with mixed vegetables. Minced pork stir-fried with chilli and mixed vegetables. Hot and sour fried rice with eggs and lemongrass. Rice noodles, eggs, bean sprouts and crushed peanuts. Flat rice noodles, sweet soy sauce, Chinese broccoli and eggs. Flat rice noodles, fresh basil, chilli and eggs. Stir-fry with chilli jam topped with cashew nuts. Stir-fried thin rice noodles with oyster sauce, bean sprouts, shallots, curry powder and eggs. Noodle soup with tender beef, beef balls and bean sprouts. Hot tangy soup with noodles and vegetables. Coconut curry soup with noodles. Flat rice noodles, gravy sauce and Chinese broccoli. Crispy pork stir fried with Chinese broccoli with a touch of chilli. With coconut milk and taro.